I wound some new coils for my Protank mini's the other day. These were not to hard to fit. They were a little fiddly to get them in nice and straight but over all easier than fitting a coil to my fogger. I have used 30g kanthel wrapped 5 times around a 2mm drill bit and then used a slightly smaller bit to sit the coil as low as possible but still line up with the slots. My ohm meter batteries are flat so don't have an accurate resistance at the moment but I will post it when I get my meter running again. I threaded the coils with cotton wool and fitted a couple to my Protanks. These produce heaps more vaper than the originals to the point that I think I could reduce my nic levels. I haven't had any flooding or dry hits and the Protanks are set up the same as they were when I bought them other than the coils and cotton wick (no flavour wicks). 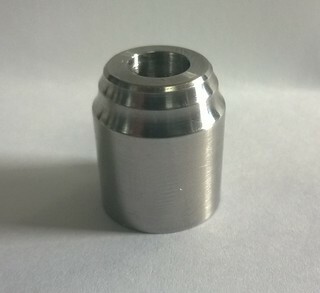 The dripper base in the photo is a IGO-W and the other photo is a 316 stainless housing I made for it the other day so I can try bigger air holes without butchering the original. Crisscross and essiemessy like this. This is exactly the way I have built my mini protanks. I have also built with 6 wraps around a 2mm drill bit and using cotton. My coils read 1.5ohm. I am more than happy with the way they vape. Heaps of flavour and plumes. I run a couple of KFL+ on vamo'd and provari and these little protanks are not too far away from those in vape quality. I am now playing with cotton flavour wicks laid over the coils, together with the coil wick, just like the original but as said...made of cotton. To do so I've actually cut some small sections of the chimney skirt to give room for these flavour wicks. Am I impressed with my first version using both the coil wick and flavour wick? ........ you bet your life I am. I just love these mini protanks ..... they look good, they have glass tanks, they don't leak, they are easy to build and with a little work ..... Just perform as well as much more expensive RBA's. So who will let me pay them to make half a dozen of these for me? I love cotton ball wick, I already take out the silica wick in my old coils and put cotton in because the flavour is so much better. If I could have some of these you bewt coils it might solve some of my problems. These type of coils last longer than normal ones, right? Sturdier? Are they micro coils? 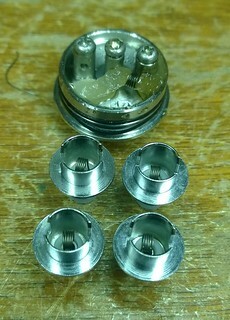 Yep, sure are micro coils ... see the pics Midlife posted, very nice coils. JenJ, I have coils in my mini protanks well over a month old. Whenever they go off (once a week maybe) I pull the tank, pull the cotton wick from the coils, dry burn the coils (short term burns as you don't want to melt your insulator) and just thread in some more cotton. I have yet to have one of my own coils fail. The main weakness I see with the protank is the same weakness that all these bottom coil tanks share. That is the degradation of the rubber insulator that separates the two coil leads. 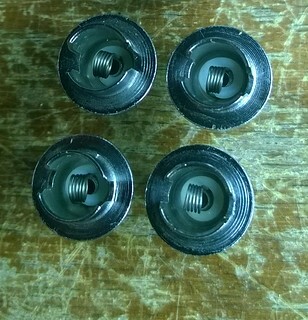 I have had two pull apart when I removed them from the coil atomizer. It is also why you should restrict the period of dry burns, because the coil leads get so hot they melt the insulator. Given the superb quality of Midlife's coils and given he/she is in WA then I'm sure he/she will make some for you. Failing that I'll make some for you and send them to you in a little olde matchbox. essiemessy and JenJ like this. JenJ, just send either DaveJ or electron some of your old atomizers...ie. the old coil bases and I'm sure they'll coil em for you. Failing that .. I'll do it but I'm in Brisbane and you're over that other side of Oz. The cost of wire is bugga all. I think I paid about $12.00 for 100feet of 28G and 6 coils would use less than 3 feet. Ok, good idea. I'll ask them if they are up for it. JenJ I will do some for you if you want but I wouldn't be able to do them until the weekend as I am working long hours at the moment. I have a few other coils to do for my pro tanks plus some other atomizers next weekend so It wont be a hassle to wind a few for you. I wouldn't want any payment to do these all I would need is your old coils and preferably that you are able to pick up and drop off the coils during working hours in Welshpool. If that not possible then we can always use aust post. I will also need to know what resistance you would want. I still haven't accurately checked mine but I am presuming they will be between 1.2 and 1.4 ohms. If DaveJ or electron are going to do some for you that's cool they can do them for you but my offer is there if needed. Thank you so much for offering Midlife. I will check with Dave and electron and let you know. That's mighty impressive! So much so, that by the time I'm proficient enough to do the umpteen recycled ProTank coils once the existing dry-burned ones finally cark it, I'll be ready! In the meantime, I was inspired enough to stuff some cotton into an empty one in my stash and give it a go.